This isn’t the sort of thing we normally cover on Ultra Culture but when 14 million people are suddenly introduced to Harmony Korine’s Gummo at 9pm on a Saturday evening, the blogs have a duty to respond. Last night was Movie Week on The X-Factor which meant that contestants had to sing songs from movies. Contestant Jamie Archer chose Roy Orbison’s ‘Crying’ and cited its use in the Harmony Korine movie Gummo, although it is also sung (in spanish) in that amazing scene from Mulholland Drive. 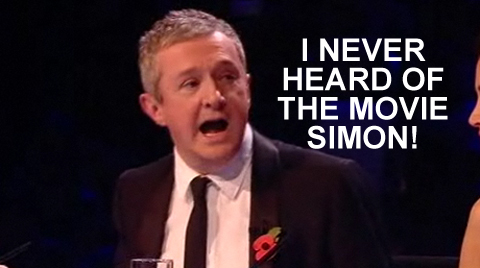 Louis Walsh was very concerned that he was not aware of the movie. Simon Cowell responded quite cryptically that it was not ‘a movie you watch at home’, possibly referring to the fact that the film has long been out of print on Region 2 DVD. Next week, why not fly over to the States, buy Gummo on Region 1 DVD, and make it a Saturday-night double bill? Musical elimination fun followed by cat-drowning and furniture-combat. Enjoy!